For the Constitutional Court of Korea judge, see Ahn Chang-ho (judge). Ahn in Los Angeles, California. Ahn Changho, sometimes An Chang-ho (Korean pronunciation: [ɐn. 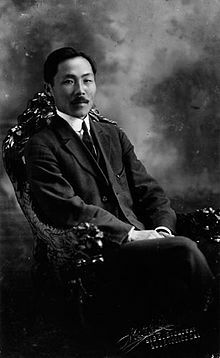 tɕʰɐŋɦo]; Hangul: 안창호; Hanja: 安昌浩, November 9, 1876 - March 10, 1938) was a Korean independence activist and one of the early leaders of the Korean-American immigrant community in the United States. He is also referred to as his pen name Dosan (도산; 島山 [tosʰan]). A protestant social activist, he established the Shinminhoe (New Korea Society) when he returned to Korea from the US in 1907. It was the most important organization to fight the Japanese occupation of Korea. He established the Young Korean Academy (흥사단; 興士團) in San Francisco in 1913 and was a key member in the founding of the Provisional Government of the Republic of Korea in Shanghai in 1919. Ahn is one of two men believed to have written the lyrics of the Aegukga, the South Korean national anthem. Besides his work for the Independence Movement, Dosan wanted to reform the Korean people's character and the entire social system of Korea. Educational reform and modernizing schools were two key efforts of Dosan. He was the father of actor Philip Ahn and U.S. Navy officer Susan Ahn Cuddy. Ahn was born Ahn Ch'i-sam, on the 6th day of the 10th lunar month 1878 in Kangso Pyeongan province, in present-day South Pyongan, North Korea. His birth date is equivalent to 10 November 1878 on the Gregorian calendar but he chose to use the date 9 November 1878 on his vita. Ahn is the family name, chi is the generation marker, and sam refers to the fact that he was the third son of Ahn Kyon-jin (father), and Hwang (Mother). Dosan is of the family of the Sunheung Ahn (순흥안씨; 順興安氏) lineage. It is believed that he changed his name to Chang-ho when he began public speaking as a teenager. His father also changed his name from Ahn Kyo Jin (not Ahn Kyon Jin as previously entered - He is another person and in no way related to Ahn Chang Ho. This error has been repeated numerous times due to this incorrect information posted here.) to Ahn Heung-guk, (assumed to be his father's name). In 1894, Ahn moved to Seoul where he attended Save the World School (Gusae Hakdang) in 1895, a Presbyterian missionary-sponsored school in Seoul run by Horace G. Underwood and Rev. F.S. Miller. Dosan eventually converted to Christianity. While Dosan was a student at Gusae he worked for Dr. Oliver R. Avison at Jejungwon, the first medical institution in Korea which became Severance Hospital and is now part of Yonsei University Medical Center. On November 8, 2013 Dosan was posthumously given an Honorary Diploma by Yonsei University in recognition of his attendance at Gusae Hakdang as a student and for his work there as a teaching assistant; and, for his work at Jejungwon while at Gusae and at Severance Hospital in the early 1900s. In October 1902, Ahn came to San Francisco with his wife Helen (Hye Ryeon Lee/이혜련) to pursue a better education. They were the first married couple to come from Korea to the Mainland. Their passports from Emperor Gojong were numbers 51 and 52. Ahn Changho started working as unofficial ambassador for Korea(Joseon). While living in San Francisco, California, he witnessed two Korean Ginseng merchants fighting in the streets over sales turf. Ahn was apparently upset by this display of incivility among his countrymen overseas, so he began to invest time into reforming the earliest local Korean community members, rising to become one of the first leaders of the Korean-American community. He founded the Friendship Society (Chinmoke Hoe/친목회) in 1903, the first group that was organized exclusively for Koreans in the United States. April 5, 1905, he changed the Chinmokehoe name to the Mutual Assistance Society (MAS)(Kongrip Hyophoe/공립협회) with its headquarters at 938 Pacific St. in San Francisco. This was the first Korean political organization in the United States. The first Korean newspaper Kongnip Sinbo started on November 20, 1905 there. In reaction to the Durham White Stevens assassination on March 23, 1908 the MAS would eventually merge with the United Korean Society (Hapsong Hyophoe/합성협회) in Hawaii to become the Korean National Association (Daehan Inguk Hoe) (대한인국민회; 大韓人國民會) in 1909, the official agent of Koreans in the United States until the end of World War II. In 1926 departing from San Pedro, California by ship, Dosan traveled back to China, never returning to the United States. During Dosan's anti-Japanese activism in Korea, he was arrested and imprisoned by the under Japanese rule|Japanese Imperialist government]] at least five times. He was first arrested in 1909 in connection with Ahn Chung Gun's assassination of Itō Hirobumi, the J Resident General of Korea. was tortished many times durinyears of his activism. In 1932 he was arrested in Shanghai, China in connection with Yun Bong-gil's bombing at Hongkew Park (April 29, 1932). He was a naturalized Chinese citizen at this time and illegally extradited back to Korea, where he was conv of violating Japan's "Preservation of Peace Laws" and sentenced to five years in Taejon prison. In 1937, Japanese authorities arrested Ahn, but due to complications from severe internal illness, he was released on bail and transferred to the Kyungsung University Hospital where he died on March 10, 1938. Many consider Ahn Chang-ho to be one of the key moral and philosophical leaders of Korea during the 20th century. In the turmoil immediately before and during the Japanese occupation of Korea, he called for the moral and spiritual renewal of the Korean people through education as one of the important components in their struggle for independence and building a democratic society. Dosan also included economic and military components in his independence movement strategies. A memorial park called Dosan Park (Korean: 도산공원) and hall were built to honor him in Gangnam-gu, Seoul. 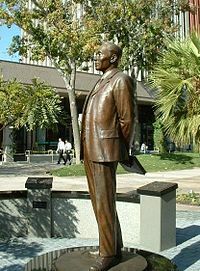 Another memorial was built in downtown Riverside, California to honor him. Ahn's family home on 36th Place in Los Angeles has been restored by the University of Southern California, on whose campus it sits (albeit in a different location). Dosan never lived in the house on the USC campus since the Ahn family moved there in 1935 many years after Dosan had gone back to Shanghai. At the request of Congresswoman Diane Watson, the USPS Post Office in Koreatown at Harvard and 6th Street was named Dosan Ahn Chang Ho Station. This was the first USPS naming honoring an Asian. In 2011, the Ellis Island Foundation installed a plaque honoring Dosan to commemorate the 100th year anniversary of his entrance to the United States through Ellis Island from London on September 3, 1911. He sailed from Glasgow aboard the SS Caledonia. The City of Los Angeles, in the early 1990s, declared the nearby intersection of Jefferson Boulevard and Van Buren Place - across from the Korean National Association and Korean Presbyterian church - to be named "Dosan Ahn Chang Ho Square" in his honor. A main freeway interchange in downtown Los Angeles where the 10 Freeway and 110 Freeway meet is named after Dosan Ahn Chang Ho. The third pattern of ITF-style Taekwondo which is made up of 24 movements is called Do-San or Dosan in his honor. This is the pattern is required to advance from 7th Kup Yellow Belt with Green Tag to 6th Kup Green Belt. In 2012, Ahn was posthumously inducted into the International Civil Rights Walk of Fame at the Martin Luther King Jr. National Historic Site in Atlanta, Georgia. His grandson Philip Cuddy accepted the honor at the ceremony in Atlanta on behalf of Dosan. November 8, 2013 Dosan was given an Honorary Diploma by his alma mater Yonsei University in recognition of his service as teaching assistant at Gusae Hakdang and for his work at Jejungwon and Severance Hospital. Dosan was also a good influence on many Yonsei and Severance Medical School alumni. Susan Cuddy's son, Philip Cuddy, initiated the awarding of the honorary diploma providing the historical records to Yonsei President accepted the diploma in a ceremony in Seoul on behalf of Dosan. ^ An Pyong-Uk (2003-07-24). "Dosan: The Man and His Thought". Global Korean Network. Archived from the original on 2003-06-06. Retrieved 2007-04-14. ^ "A Brief History of Korean Americans". National Association of Korean Americans. 2003. Retrieved 2007-04-14. ^ "House Report 108-815 - ACTIVITIES of the HOUSE COMMITTEE ON GOVERNMENT REFORM ONE HUNDRED EIGHTH CONGRESS FIRST AND SECOND SESSIONS 2003-2004 (Pursuant to House Rule XI, 1(d)(4))". www.govinfo.gov. Retrieved 2019-04-04. Patriot Dosan Ahn Chang-ho Memorial, International Relations Council of Riverside, CA. This page was last edited on 21 April 2019, at 13:27 (UTC).